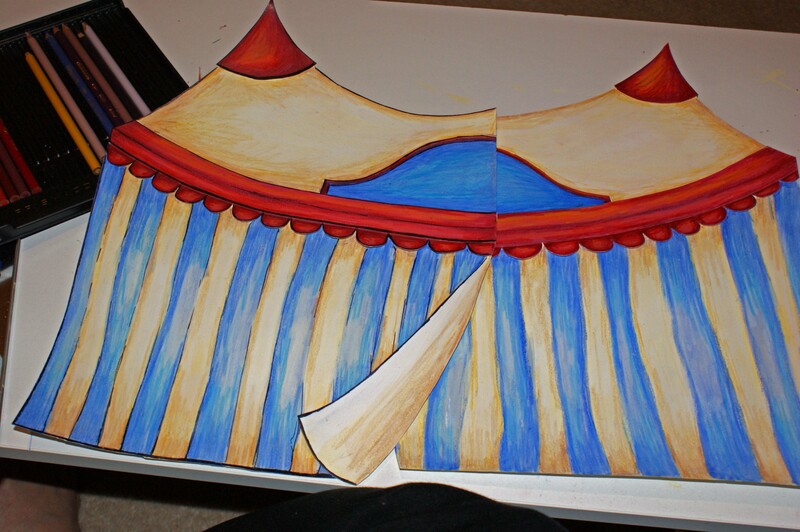 I have started on my on-line course with Jane Davenport and Teesha Moore and am erecting my big top. So much fun and a really interesting group of people chatting away on its Facebook group. Really interesting to see what people are doing. There are many different skill levels and just as many different styles and interpretations. 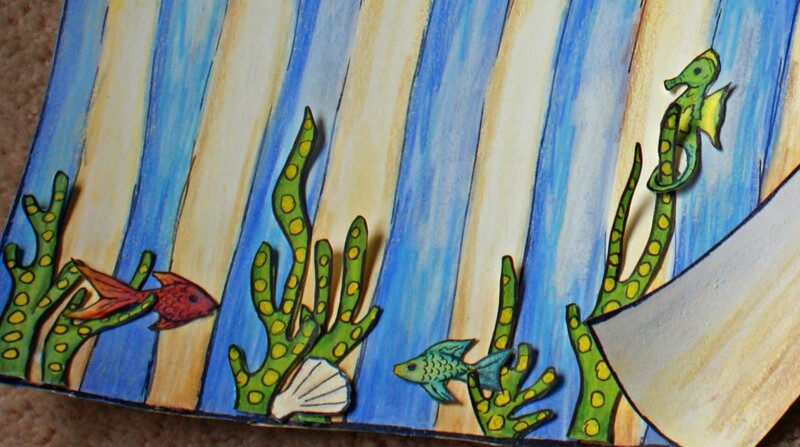 Our first assignment is to make a shaped art book and do collage mermaids or other creatures in it. Although I loved the mermaid shaped pages, I did not want to do that many mermaids or that many drawings, I would never get the time or energy to fill it. 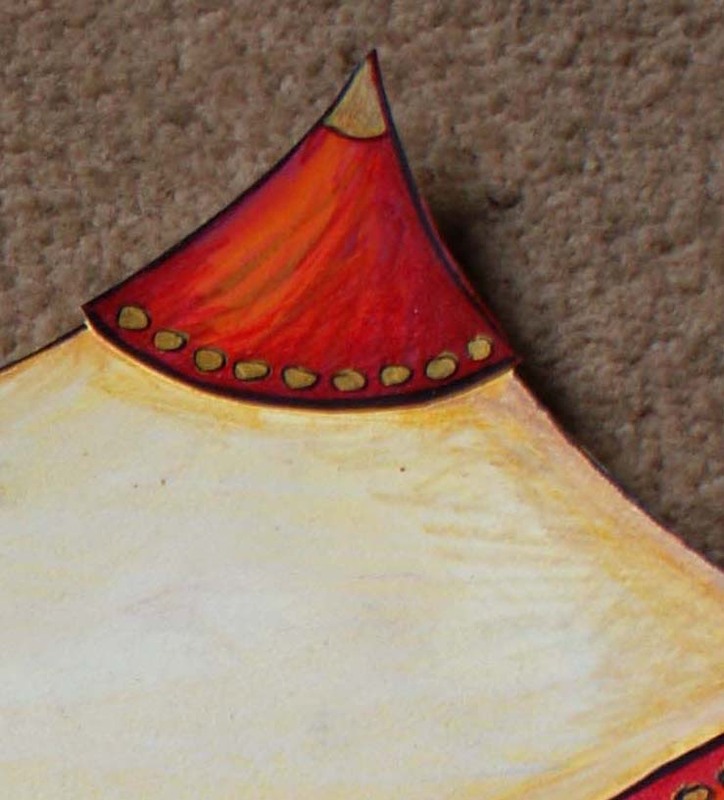 So I decided to do a circus tent cover for my Art Book and do fairly regular shaped pages so that i could do a variety of things in it. 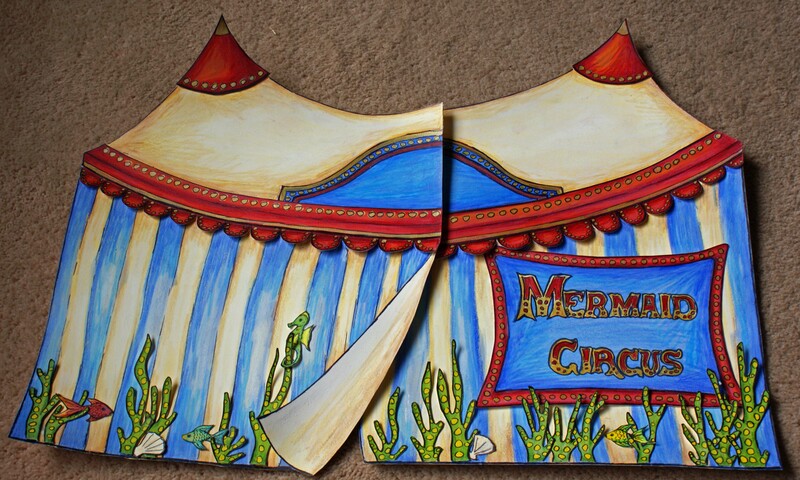 I wanted to use the tent more literally and make the front cover where you walk in and then show the inside of the big top inside with the pages turning to show different acts. I have set up a pinterest site with all these vintage circus photos which provided such great inspiration. So these are the steps I took to do the front cover. 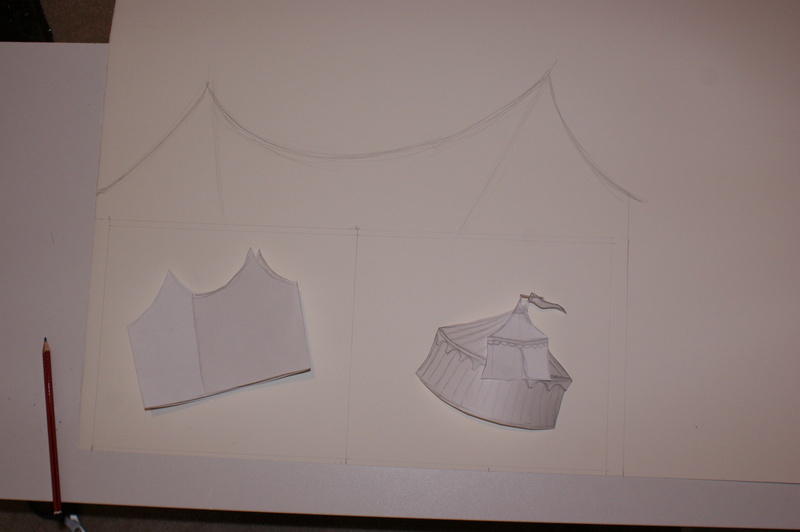 I sketched a number of tents on scrap paper and did a mock up of the tent and sketched it out onto my good paper. 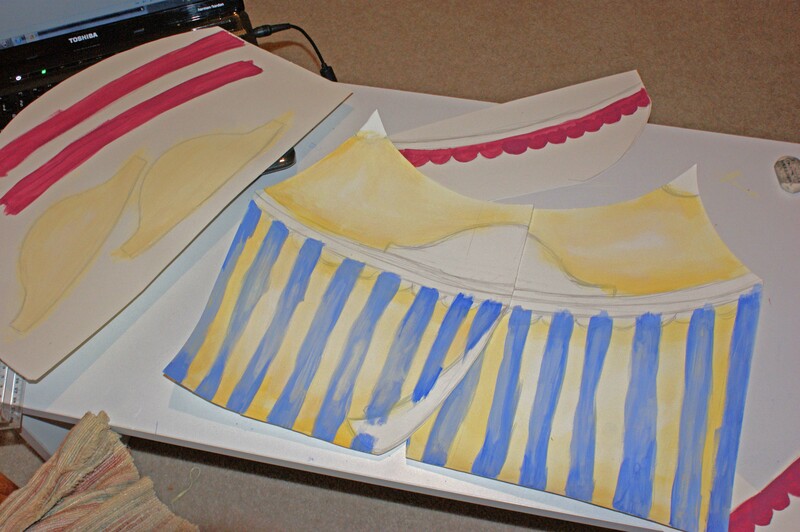 I then used acrylic paints to fill in the main colours and paint the bits I wanted to stick on. Then I went over with my colour pencils to give it depth, I only used three colours for this as I did not want to take too long. A light (a couple of shades lighter than the paint), medium (some shade as the paint) and a dark ( a couple of shades darker than the paint). After I had roughly coloured them in I went over them with the white pencil to blend them in, and knock them back so they were not too bright. Next came the black pen to do the outline, this highlights the shapes and brings it all together and I just like outlines, it gives my work a more graphic look. The sign came next not sure if I am happy with this or not, but up it went, you just can’t agonise over things too much. Looking at it I decided it need some more lift and put in the gold dots. Then having another look I decided the tent was too plain and added the seaweed and the fish etc. So that is how it was created, it will change before the end as I continue to work on the rest of it, but I will keep you updated. I have been luck enough to be the Feature Artist for this month for the Australian Coloured Pencil Network. Here is the start of the article follow the link for the rest. Name: Karen Bailey Website address: occasionalartist.wordpress.com Location: Melbourne Victoria All images copyright of the featured artist and maynot be reproduced without written permission. © 2010-2013 All rights reserved. To read the rest of the article please follow the link to the ACPN website and while you are there have a look around. Thanks Belinda Lindhardt, you do a great job with the network. 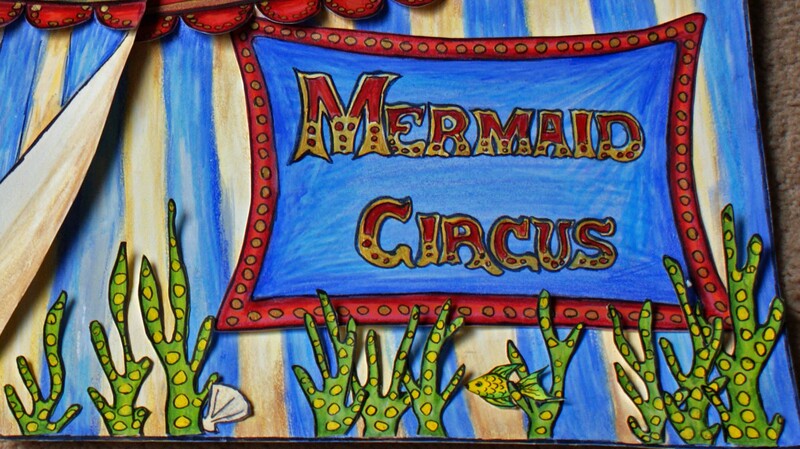 On Monday I start an on-line art course, I am not really sure what I will be doing, but it will involve circus, mermaids and loads of colour, but most of all fun. I have been a fan of Jane Davenport for a while, she is so much fun and she really has a lovely way of getting people excited by art. (See earlier post when I bought art supplies from her) I have never done a course with her before but I have watched many of her YouTube clips and they have such energy and joy about them I find them inspirational. As you can probably tell by my lack of posts my energy has been down this last couple of weeks and I have been bogged down with thoughts of framing and exhibiting my work, I decided to do this course, just have some fun and see where the journey takes me. I am also interested in these on-line courses and how well they work. Jane has done many of these courses and this one is with Teesha Moore a very talented American artist. So although journaling as such is not my normal style, what the heck lets just have fun!!!! !